Drop Wizard Tower is a strange but enjoyable beast. You take control of a wizard who can pretty much just move left and right, while occasionally tossing out magic after landing on a new platform. It's weird, it's a little tricky, and it's probably going to get on your nerves a little before you get the hang of it. Sure there are really only two buttons you have to worry about (three if you count the occasionally available special attack), but the nuance comes from navigating through each stage and dealing with its enemies. Not all enemies are created equal. Learn what each enemy type can do. Some will stay on whatever platform they're inhabiting, some will simply wander around and fall off whatever ledges they come across, and still others can switch between sticking to the floor and sticking to the ceiling. Knowing the difference can make all the, well, difference. Take it slow to start. 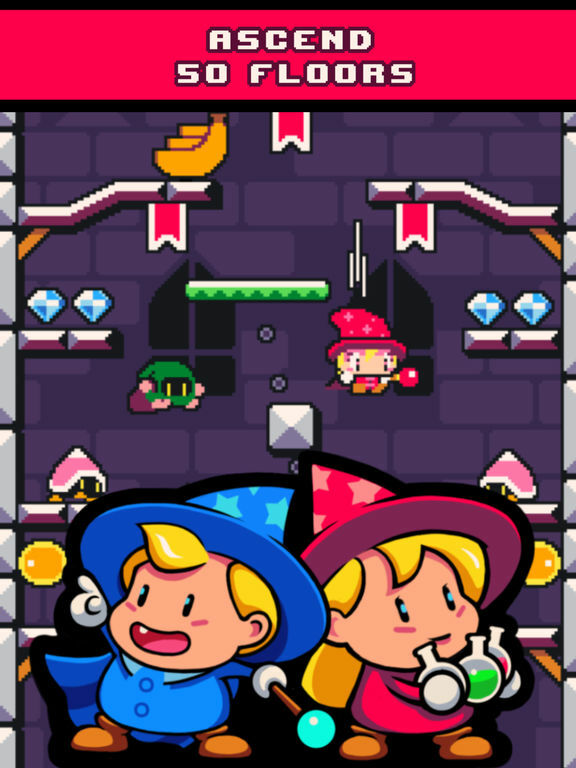 Most of the time you'll have able opportunity to study their moves since the wizard begins each level on an empty platform, which is usually above any potential threats. You'll have a fair number of seconds to see who does what, and know whether or not they'll be able to drop in on top of you while you study them. The wizard cannot move left or right while falling. This seems like a pointless distinction but it can actually be very useful. Since the wizard always falls straight down, you can use that hang time to change the direction he's facing to better aim the magic he'll fire off upon landing - all without having to worry about landing on top of an enemy or moving too far off to land on a platform. Use your magic. Little by little the icon between the two control arrows will fill up. Once it's full the icon will blink, and you can tap on it to unleash a powerful magic attack that varies from wizard to wizard. Different wizards have different specialties. You can unlock new wizards by spending the gems you collect while playing. They each have somewhat different stats for things like speed, magic power, and stun duration. In addition, they often have slightly different regular attacks and their own unique specials. Pits and passages loop. If you fall into a pit at the bottom of the screen, you'll drop back down from the top. If you walk off-screen through an open passageway, you'll appear on the opposite side. These rules also apply to enemies, so be careful as you move around. Level-up with a purpose. Each wizard has their own grid of level-up perks that can do things like increase their stun duration or refill a little bit of their health. The catch is that once you pick your first perk, you can only choose from the perks that are connected to that initial one via a straight line. Remember this as you level-up, and if you can, try to make your first pick something with a fair few branching paths. It does take some getting used to, but Drop Wizard Tower is ultimately a pretty good time. Provided you can get the hang of the slightly quirky mechanics it can be downright habit forming. Definitely recommended, if for no other reason than you might be curious and what's the harm? To be honest, I wasn't all that fond of Drop Wizard Tower at first. It felt like the gameplay was too simple, but at the same time it was frustrating to get the timing down - so I wasn't having any fun either way. Though after spending more time with it and getting used to the particular way the main character has to move, I did find myself having fun. It just took a little patience. Drop Wizard Tower sort of reminds me of Bubble Bobble, but without the bubbles. Hear me out. The wizard can only move left or right - no jumping or attacking - but he can drop off of platforms and toss out a bit of magic once he lands, which is the main way you're going to be attacking enemies. When an enemy is hit with a magic blast they'll be stunned, and stunned enemies can be summarily kicked in order to eliminate them. Plus the enemies you kick can potentially knock into other enemies and eliminate them as well, so bonus! It's the dropping, stunning enemies, and the need to kick stunned enemies that makes me think of spit bubble spewing dragons. It's a pretty engrossing combination of gameplay elements, honestly, even without a real connection to the arcade and NES classic. Anyway, I appreciate how straightforward the control scheme is. Tap the left arrow to move left, right arrow to move right, and tap the lightning symbol in the center to use special magic once the meter i full - that's it. This makes the game very accessible and easy to learn, which is always a good thing in my opinion. Of course the flip-side to that is how tricky it is to get used to the fact that you can only attack when you land on a platform. This was a pretty major stumbling block for me when starting out, and sometimes trips me up even now. The slightly floaty way the wizard falls provides a little time to make sure he's pointed in the proper direction, but I've accidentally missed my shots and had to circle back around (i.e. fall off the bottom of the screen and come back down from the top) quite often. On top of that, there have been more occasions than I'd care to think about where I accidentally timed my drop wrong and ended up hitting the platform at about the same time an enemy was passing underneath. Sometimes this would swing in my favor, with me stunning the enemy right before they reached me. Other times I'd just smack into them and lose a life. This, plus deciding what to do in general, gets even more difficult when more enemies and new enemy types start to fill the level. The unorthodox control scheme is tricky enough when there aren't a dozen other things moving around all over the screen. 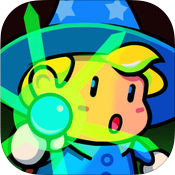 I have to admit, though, even with all the chaos and the somewhat enigmatic timing Drop Wizard Tower has been a pretty engrossing arcade-style game. Levels aren't procedural, but they do appear to come up in slightly different orders with each new playthrough. 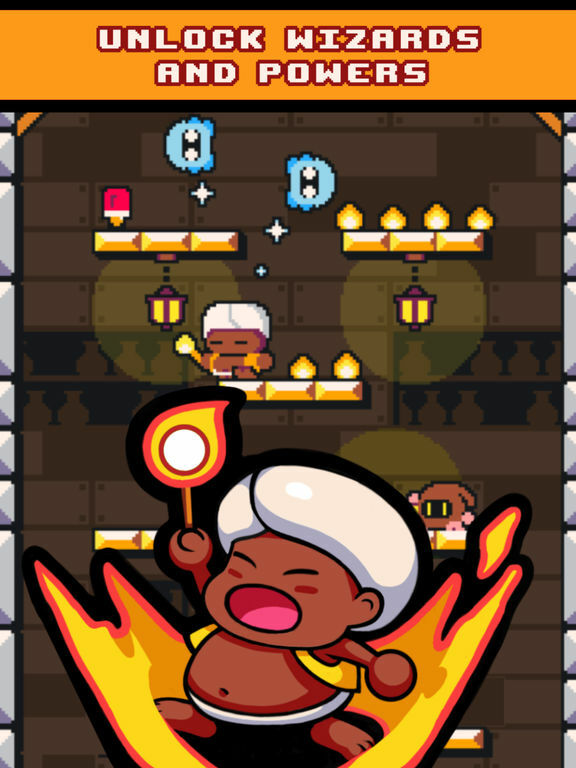 The wizard can also gain levels by collecting the gems that enemies drop, and each new levels lets you decide whether you want to increase his speed, magic power, and stun duration. And complain as I might, I do find the gameplay to be enjoyable even with the timing issues I've been running into.